In today’s fast-paced supply chain environment, it’s critical for owner operators to access a convenient marketplace of freight spend. Systems that can provide this critical connectivity along with streamlined routing and rates can help carriers drive up sales and boost internal efficiency. Descartes Aljex™ for Carriers is a scalable, cloud-based solution that automates processes and provides end-to-end supply chain visibility. The dashboard-driven TMS hosts a sizable network of freight across the North American logistics supply chain. Descartes Aljex minimizes manual track and trace operations, increases on-time delivery performance, and provides an intuitive plug and play marketplace for carriers. With Descartes Aljex for carriers in place, it’s easy to improve planning and steer decision making with a dashboard of shipment management tools. Our freight management system was built by carriers with a “crowd improving” methodology. With continuous, customer-driven feedback, the entire community benefits from system-wide improvements. Descartes Aljex for Carriers includes a document management system supported by robust imaging and storage capabilities. Carrier rate acceptance, dispatching, and Electronic Data Interchange (EDI) are automated. Follow-up tasks such as electronic billing and e-statements are consolidated within one intuitive platform. Carriers are found faster with quality lane pricing tools and historical price comparisons that prioritize favorites and repeat customers. Descartes Aljex for Carriers is part of the Descartes Transportation Management solution suite. The solution offers broad multimodal shipment management and logistics flow control capabilities to optimize and direct the movement of goods from order to receipt. 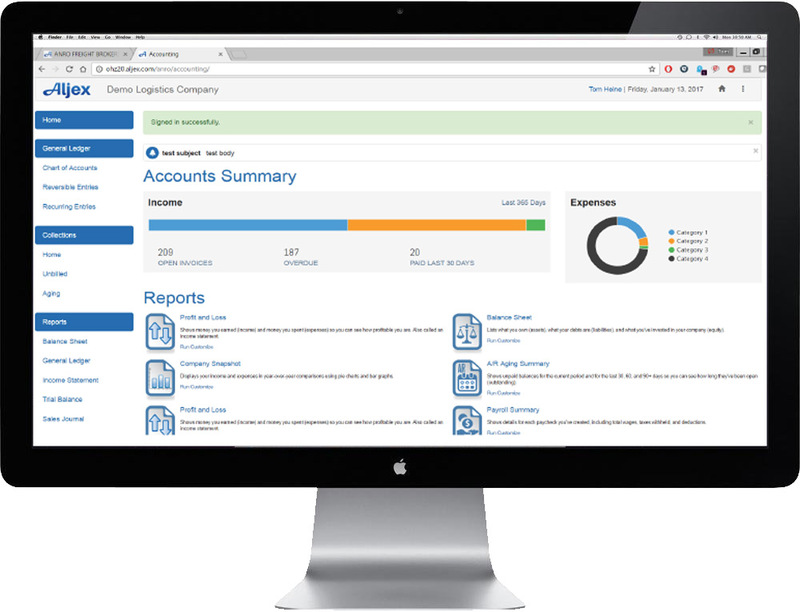 Aljex trucking software for carriers lets you customize hundreds of reports to help you make strategic decisions quickly and efficiently. Our software is simple to learn and use by utilizing our reliable video and live training. We include live support with all of our with our freight management system packages so you always have a person to speak to with any questions you may have.